I have a big back so no worries, the head will not look so strained on yours. This means it is fabulous, and you can own it if you run to Daffy's Herald Square, 6th floor registers, and ask for "Jenny L's" hold. 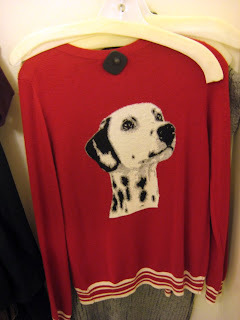 Look, it's an adorable, collegiate-retro sweater in the front, and a crazy, dog lady sweater in the back! I can say that, being a crazy cat lady. 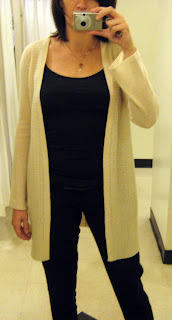 This is also on hold with the dog head, a White + Warren 100% cashmere cardigan ($89.99). Just in case you're not into Dalmatians. I've just bought one with mary poppins's all over it even though it's summer here in Oz. P.S - your back is hardly BIG my lovely! oh, if only it had been a cat. I'll take a wolf on a handbag, but not a pooch on a sweater. you look like a t-bird! 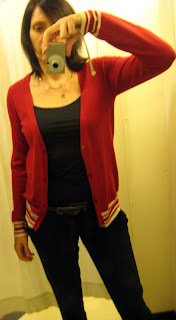 Awww haha, I actually really like the first cardigan! Wow, even though I am so scared of dogs. The print behind's so adorable! Both are glorious, but the dalmatian cardi gets the "conversation starter" award. oooohh cashmere! I really love that one. So cute. I think the puppy one is so adorable! Thanks for sharing. Oh Miss Fashion -- that would be so perfect for the SIL, she has a Dalmatian! The BEBE pix were fun! You look positively smokin' hot in some of them! I vote "fabulous" for the Dalmation cardi, but strictly on a camp basis. The white cardi looks like it belongs in my wardrobe. enc, I couldn't agree more, on both points. TP - if you need a little personal shopping done for the SIL, I can search for it on Monday, email me! 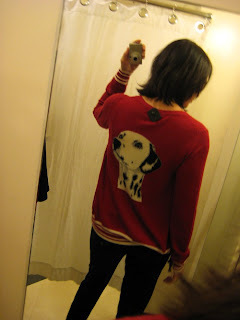 digital - I'm in love with the dog sweater! It can go so many ways. sal - exactly! handy during dull holiday parties. yiqin - this doggie is guaranteed perfectly harmless, unless you're allergic to wool blends. dapper - agreed, love it. kati - you mean like the gang, the thunderbirds? It's very Grease II. wendy - I understand, the pooch on the sweater is so country club, wicker bag wearing. But for this one I could make an exception. la belette - don't make me get out the atlas! bowerbird - mary poppins??? Jealous! 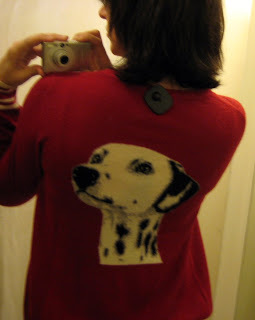 Hmmm... the dog cardi is veering slightly into crazy dog laydee territory but still looks kinda late 50s cool. White cardi looks like a dressing gown to me.